After nine months of construction, the TTC has announced that two-way bus service will return to Roncesvalles on Monday, April 26 at 5 am. The buses will leave Dundas West station and travel south to the Sunnyside loop, where passengers may board the streetcar and continue along King. The westbound 504 King streetcar will continue to turn back east at the TTC’s Roncesvalles yard, requiring passengers travelling to the subway to transfer to the bus at Queen/Roncesvalles. 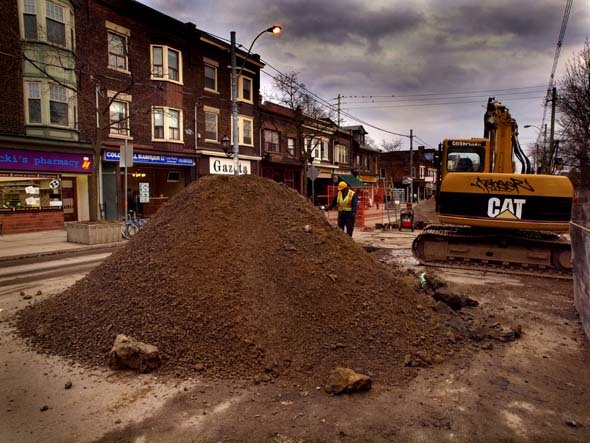 With the end of water main/sewer replacement, construction will now pause along Roncesvalles for a few months. Likely in June, the long-awaited streetscape improvement project will finally begin. Streetcar tracks will be replaced, along with most of the sidewalk. New streetscape improvements will include new trees planted at grade in healthy growing conditions, accessible streetcar stops, the leveling of the Roncesvalles “two-step,” shorter crosswalks, and new public spaces. The construction is scheduled to be completed by November. Since this is all surface work, it is expected, or at least hoped, that construction will proceed without the unplanned delays that occurred with the less-predictable sewer replacement work. Meanwhile, parking meters have been removed from Roncesvalles until the end of construction. As a result, there now is free three-hour parking in any legal space along Roncesvalles. Please note that you will still get a ticket if you park in a no-parking zone. A reminder to those who have become used to traffic only travelling north on Roncesvalles: look BOTH WAYS before crossing the street! This entry was posted in ARCHIVE, Construction, Front Page on April 24, 2010 by admin. Can lessons from the St. Clair streetcar project be applied here? The TTC has just published “Getting it Right: Lessons from the St. Clair Streetcar for the Implementation of Transit City,” written by Les Kelman and Richard Soberman. The report details the missteps that led to delays and cost overruns with the St. Clair transit project. The Globe and Mail sums up the report’s conclusions nicely: “The price tag of the new St. Clair streetcar line nearly doubled because nobody was in charge as the project’s scope ballooned, public consultation ran amok and more than 20 small contractors tripped over each other.” The authors also blamed provincial intervention, including the granting of a judicial review of the project, as a main cause for the delays. Transit guru Steve Munro has posted his response to the TTC report. He questions the report’s emphasis on “project creep” and obstinate community members, and places more blame for the delays on good old-fashioned bureaucracy, mismanagement and a “silo mentality” within City departments and agencies. He also says that the TTC resisted public input not only from steadfast opponents, but from project supporters as well, and must share considerable blame for the poor public consultations. • promoting pro-active liaison with residents, businesses and BIAs early in the final design and construction stages. The Roncesvalles Village BIA has requested that such completion incentives, along with other mitigation efforts, be written into the contract for phase two of the Roncesvalles reconstruction (set to begin probably in June). While the Roncesvalles reconstruction is tiny compared to the scope of the Transit City LRT projects, the BIA hopes that the City and TTC will examine the lessons of the St. Clair project (along with the lessons learned so far during the Roncesvalles reconstruction), and apply them here. The BIA is gathering input from merchants and the community about phase one of the Roncesvalles reconstruction, and is forwarding recommendations to City staff. If you have any observations or recommendations on how to mitigate disruption during phase two, please contact the BIA at info@nullroncesvallesvillage.ca, Councillor Gord Perks at councillor_perks@nulltoronto.ca, or post below. This entry was posted in ARCHIVE, Construction, Roncesvalles Renewed on January 19, 2010 by admin. How can we best manage disruption in 2010? Recently, BlogTO posted an article on how Roncesvalles businesses are struggling during the reconstruction, a reminder of the importance of supporting local businesses during the holiday season. The BIA urges all Roncesvalles residents, please, to brave the occasional dust blast (and chilly breeze), and drop by your local shops, services and restaurants. We need you now more than ever! The article mentions several business closures, although it is not clear that all these closures were due to the reconstruction. What is certain, however, is that business is down, and the 30 percent drop that Len McAuley from Pollocks reported sounds typical for the street. Is there way of mitigating the disruption during the second phase of construction (to begin in the spring with the streetcar track and sidewalk repairs)? In addition to urging continued local support for Roncesvalles businesses, the BIA would like to ask community members for their observations of how this first phase of construction has been managed. What can be done better to ensure that the second phase proceeds as smoothly as possible? Good suggestions should be incorporated into the tender document, which the City and TTC will send out shortly. 1) Do more to ensure pedestrian movement: Quite often during the first phase, pedestrians were required to walk a block or more out of their way just to cross the street. This effectively cut off businesses from half their customers. The new contract should state that pedestrian crossings shall be maintained at each block except when this is absolutely impossible. Each hour that a pedestrian crossing was closed made a difference to businesses across the street. 2) Manage the dust: Perhaps even more than parking and car access, dust and noise were main factors keeping customers off the street. The jackhammers only lasted a week or so out front of a business, but the dust remained far longer. This meant that whenever a bus drove by, a huge cloud of dust was stirred up and thrown into people’s faces. Even after the first blast, micro particles would linger in the air, making the street unpleasant for everyone and intolerable for those with allergies. 3) Contain the mess: Right now, there are several blocks along the street that are finished but still closed off due to staging materials. Wherever possible, the City should insist that staging materials be kept on the same block where work is occurring or just one block adjacent. Whenever a block can be opened up, however partially, it should be. 4) Preserve bike parking: whenever bike posts must be removed in order to reconstruct the sidewalk, temporary bike parking should be provided nearby. Car parking may need to be restricted along Roncesvalles, but there is no reason bike parking should be. 5) Accept time-based transfers at all Roncesvalles stops, allowing TTC riders forced to switch vehicles at Queen/King/Roncesvalles to shop a bit before resuming travel without requiring use only at designated transfer locations. A similar program has been in place on St. Clair. Are there any other observations/suggestions? Please contact the BIA at info@nullroncesvallesvillage.ca, Councillor Gord Perks at councillor_perks@nulltoronto.ca, or post below! The community has always understood that the reconstruction work is long overdue and is absolutely necessary to avoid having streetcars run off their rails. And disruption is inevitable with any reconstruction. But there is always room for improvement in how such things are managed. Let’s make sure the lessons learned during this first phase are incorporated into the second! This entry was posted in Construction, CURRENT, Members News on December 19, 2009 by admin. What will the City’s new Zoning Bylaw Project mean for Roncesvalles? Spacing has been covering the progress of the City’s new Zoning Bylaw Project, an effort to harmonize the City’s 43 existing zoning bylaws into one. The discussion is technical and complicated, but its results will affect all new development in the City once passed. Today, Spacing examines the section of the draft bylaw covering Commercial/Residential, the section governing main streets outside the downtown core such as Roncesvalles. The BIA urges the community to keep informed about the Zoning Bylaw Project. The City has set up a consultation portal, including an interactive map showing how each area is currently zoned. This entry was posted in ARCHIVE, Beautification, BIA Board News, Members News on October 22, 2009 by admin. Toronto’s Public Realm section is leading the detailed design phase of the Roncesvalles streetscape improvement project. The City needs your input to help them understand our local priorities and the local conditions. For example, a number of businesses have told the BIA that they are currently unable to build a patio out front due to a bus shelter or a tree planter. The locations of such items are currently being considered, so it may be possible to locate these items elsewhere nearby. But the City designers cannot know about these preferences unless we inform them. which businesses need patio/display space, and which would prefer a tree? where would benches be best used? where do pedestrians feel the most vulnerable? where do cars speed, or bottleneck, or otherwise get into mischief? what is the likely cause? where have accidents or “close calls” occurred? where do cars park illegally? or make temporary stops? or make other unauthorized use of the street? should this be tolerated or not? do people feel comfortable jaywalking, or does everyone cross only at the crosswalks? where do pedestrian bottlenecks occur? what is the cause? where do people gather (as opposed to loiter)? And where do people loiter (as opposed to gather)? where are the “dead zones” along the sidewalk, where people don’t wish to linger? What can be done to improve these areas? where do the elderly need to rest? do strollers need a place to park/lock up? if so, where? how many bike parking spots do we need? where should they go? where do parents pick up/drop off their kids? what routes do the kids take to and from school? when is parking most needed, and by whom? how many people buy their coffee to go, making quick stops in their cars? how many people drink at the coffee shop? which spaces should be greened, and which should be paved (for patios, displays or other features)? Can we do both, and if so, how? do people prefer an nice uncluttered street, or is a little clutter desirable if it adds interest? Obviously, our community is not expected to design the street. That is the City’s job. But there is a difference between a street as it appears on a designer’s computer screen and a street as it actually is used. By informing the City of our local priorities and the local conditions, be are best able to ensure that the City builds the best possible street for our community. Your input or questions can be sent directly to Councillor Gord Perks or to the BIA (info@nullroncesvallesvillage.ca). We will ensure that your comments are sent to the right people at the City. The BIA also encourages community members to discuss these questions with neighbours, fellow merchants, at your residents’ association meetings, at church, and at other public gatherings. Roncesvalles Renewed, a partnership of local community organizations, is hosting online discussions, and invites your participation. More information about the reconstruction is available here and here. This entry was posted in ARCHIVE, Community News, Front Page, Members News, Roncesvalles Renewed on October 7, 2009 by admin.